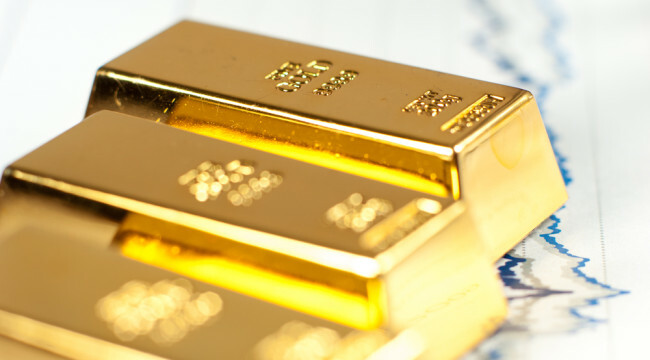 “The smart money continues to jump on the gold bandwagon,” attests our resident trading wiz, Greg Guenthner, this morning. Greg’s the editor of TheRude Awakening, Agora Financial’s trading service. These fellows must be reading Jim Rickards. “Money managers boosted their net long positions to the highest since 2011, when gold prices surged to a record,” reported Bloomberg yesterday. Meanwhile, the World Gold Council — and yes, such a thing exists — reports today that global investment demand is up 122% since this time last year. Turns out the Antichrist was right. 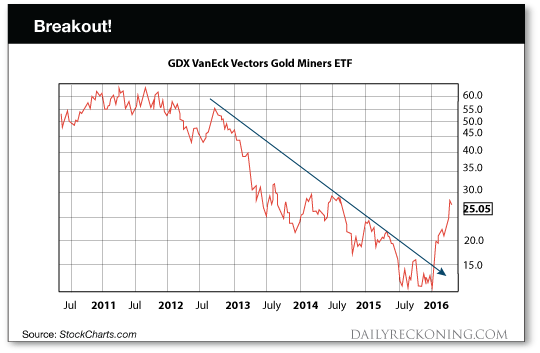 The bottom proceeded to fall out on gold, which only found its footing earlier this year. See, Greg’s a chart man. If the charts say to buy, so does Greg. If they say to sell, so does Greg. He’d sell his eye teeth if the charts said so. “If you traveled back in time to December and told the average investor that gold would be the best-performing asset of 2016, they would have laughed in your face. And gold certainly wouldn’t have earned a spot in the finance section of any major newspaper,” adds Greg. But they say it’s darkest just before the dawn. And a golden dawn has broken.